Lloyd Clark has been involved in sleddog sports for many years within the UK and in more recent years has been competing in International sprint distance canicross, bikejor, sled racing and triathlon with his two German Shorthaired Pointers across mainland Europe, Scandinavia and into Russia. 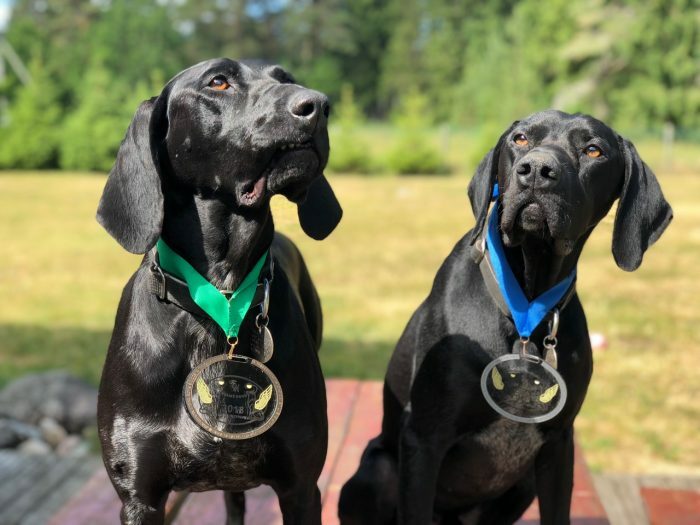 “Last year it became apparent that we were very close to the top class athletes and I decided that we needed something to give us an extra ‘edge’ but whatever we chose needed to be professionally manufactured in a controlled environment using top quality ingredients to WADA regulations; the health and welfare of the dogs always comes first and it would be better to use nothing than to risk their health or wellbeing. After a lot of searching, Racing Blue was obviously the best choice and at the end of our first season using Racing Blue STORM Athlete and STORM Canis, the dogs have ‘stormed’ to the front topping the International Federation of Sleddog Sports canicross and bikejor tables in the UK and being 2nd in the European and 3rd in World canicross rankings and 6th in both the European and World bikejor standings.